We know that the Brit Ekland Elan S2 1995 was a newspaper telephone competition . BUT what is this ? Feb 1990 front page of car magazine ? I am un aware of an early 1990 competition . Can anyone throw any light on this ? I got a scanned copy from Sy but there are no details of the competition… and it's probably a bit late to enter. GeoffSmith wrote: I got a scanned copy from Sy but there are no details of the competition… and it's probably a bit late to enter. Looks like a pre-production car to me judging by the no. plate ?? Specky ?? Or a press car ?? I know someone who won an Elan. I never thought to ask him where he won it from. He won about 5 other cars too around that time. He had a knack with caption competitions. i actually entered this competition, and one that autocar were running. i do remember one of the competitions was a wordsearch type grid where you had to find as many car manufacturers and models as possible, such as ford or fiesta. there was a bit of controversy though as people were finding 2 letters together (eg. TF - the MG TF that is ), and the winning score was in the thousands. many people complained saying this wasn't fair. i don't remember the outcome though. Rambo wrote: Or a press car ?? 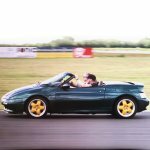 G396 KEX definitely a press car - used by Car magazine on the link above but also used by Autocar & Motor 10th Jan 1990 in the article called Duel of the Decade where it was tested back to back against an MX-5/Miata. 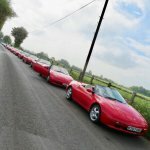 MX-5 gets good review but on the subject of the Elan's higher price was a big caption under a picture saying "You should sell your grandmother and the rest of the family, your dog, your cat and anything else to hand to have the new Elan"
G397 KEX, G482 KVG, G483 KVG, G235 MEX, G245 MEX & G255 MEX were also press cars and appeared in magazine road tests..
Phil , do you think / know that the "actual" car given away was the press car on the front ? I was wondering if it was a general release car ..